A postcard from Switzerland from 25-year-old Agnes Mary Kitchen to Reverend R. B. Layton in San Fernando, Trinidad, B.W.I. 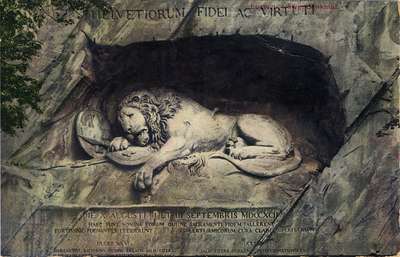 This is the famous Lion of Lucerne carved out of solid rock to the memory of the Swiss guards who fell defending Louis XVI. I think perhaps this monument appealed to me more than any other I have seen.